Established in 1981, Romsey Choral Society numbers close to 100 singers - drawn from all over Hampshire and as far afield as Wiltshire and Dorset - and presents four concerts each year, two of which are in the historic surroundings of Romsey Abbey. The Society is now widely recognised as one of Hampshire’s most interesting and vibrant choral groups, having programmed a wide range of music, with everything from plainchant to jazz. From time to time, the choir joins forces with other groups to mount large-scale works, most recently with the Waverley Singers from Farnham to sing Verdi's Requiem in Romsey Abbey (November 2017) and again in Guildford Cathedral (January 2018) . Notable other joint concerts have included Bach’s St Matthew and St John Passion (with Romsey Singers), Elgar’s Dream of Gerontius (with Nantwich Choral Society in Romsey Abbey and Chester Cathedral) ) and Mahler's 8th Symphony in the Royal Albert Hall (with Guildford based Vivace Chorus, the London Chorus, the London Symphony Chorus and the Royal Philharmonic Orchestra). Milestones for RCS include a highly prestigious joint concert with the BBC Singers in London in April 2013 and later the same year, a Remembrance concert in Romsey featuring Howard Goodall's Eternal Light and conducted by the composer himself. Since then, under the inspired direction of Musical Director Jamie W. Hall, the choir has relished bringing lesser known repertoire to audiences, including Dyson's Agincourt, Pärt's Stabat Mater, Jongen's Mass Op. 130, Nystedt's Immortal Bach and Copland's challenging a cappella work In the Beginning. Romsey Choral Society aspires to produce concerts of the highest quality. A review of the choir's recent performance of Brahms' Requiem - using just piano and Brahms' own arrangement for four hands - praised the results of expert direction which "achieves considerable cohesion and blend from eighty singers" being "impressive in soft chording and crisp in enunciation". It was a performance worthy of honouring the fallen 100 years on. The Season starts on 1st September annually and extends for a period of 12 months. Our Abbey concerts are usually in November and July augmented with a spring concert usually in St. Cross Church, Winchester. The Christmas period brings opportunities for carol singing either in the form of our own Christmas concert, or more recently, by providing a choir in support of local charity groups for their fund raising carol concerts. On the occasion of our 30th anniversary, six chairmen and a founder member. 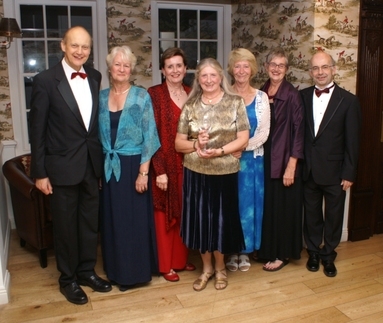 Mike Hollingworth, Di Davies, Kath Tilling, Edna Rowland, Joan Robinson and John Tilling. In front founder member Myra Glover.